Remember that time on Arrested Development when George Sr. said, "I'm having a love affair with this ice cream sandwich." No? Just me. Well anyway, that's how I feel about this locket. In other news, we have a giveaway winner. Um, me too. It's gorgeous! Now that's a locket. Really beautiful. I love Arrested Development. Why did it go away? Why? That locket is GORGEOUS!! I love it! GORGEOUS. 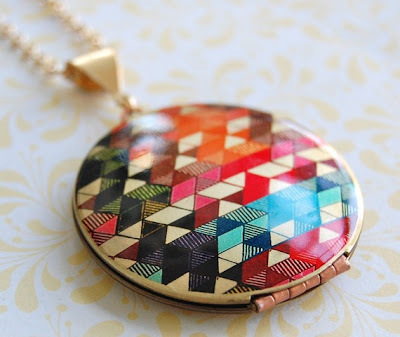 I love lockets and this one is a beauty!! ooh. beautiful. i love colorful things like this! Oh how beautiful. It's so artistic and colorful! Thanks for the lovely comment. Your blog is now on my list to follow!! I am in love... it is on 'the list' ;). I'm so in love with this locket and all its awesomeness. How could you not?! It's soooo lovely. Yes, I am in LOVE with those lockets. I saw them somewhere else and it was instant. I LOVE and not just LOVE but <3 that locket! I mean come on! Perfection! Oh Arrested Development, how on earth did you get canceled?? Thanks for visiting my blog! So lovely to meet you and your pretty blog. :) Have a great day! That necklace is absolutely delightful!! PS ... did you make those muffins? XO!!! absolutely breathtaking! I just visited the shop...to die!